Nine days after the UCI jury made the controversial move to expel world champion Peter Sagan, another rules controversy has erupted at the Tour de France. 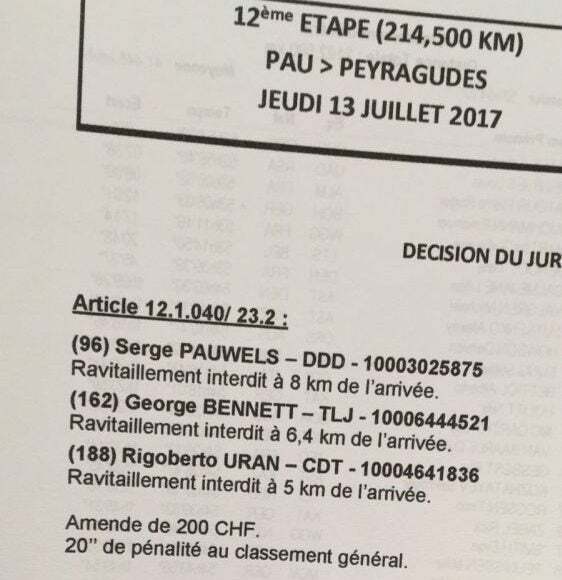 On stage 12 to Peyragudes, Rigoberto Uràn (Cannondale-Drapac) and George Bennett (LottoNL-Jumbo) were penalized for taking late feeds. Frenchman Romain Bardet (Ag2r La Mondiale) escaped punishment although video indicates that he too broke the rules. UCI rule 2.3.027 states, “Feeding is prohibited on climbs, descents and during the first 50 and last 20 km.” On Thursday, the jury even allowed riders to take feeds up to the final 10 kilometers. In fact, there was a feed zone with 12.5km to go in the 214.5km stage. Perhaps the jury turned a blind eye to Bardet’s bottle, but Kiwi Bennett was not so fortunate. He was docked 20 seconds in general classification. According to the jury, he too took a hand-up with 6.4km to go. The jury’s post-race statement said Uràn took a feed with five kilometers to go. The UCI slapped the Colombian with a 20-second penalty as well. Cannondale-Drapac director Jonathan Vaughters said on Twitter that his team accepted the penalty but pointed out the unfair application of the rule in stage 12. Over the course of two phone conversations, Cannondale-Drapac director Charlie Wegelius pled his case to UCI jury president Philippe Mariën. According to Vaughters, Mariën first accused Uràn of taking a bottle from team staff. Vaughters said that hand-up came from a super-fan, not someone with Cannondale-Drapac. “The guy who fed Rigo doesn’t work for us. We clearly didn’t tell him to give him an illegal feed,” said Vaughters “This UCI guy, Phillipe Mariën is making it up as he goes. It’s incredible incompetence. “We would prefer that nobody was penalized but if you have to penalize someone, you have to penalize Bardet as well,” Vaughters added. Mariën did not respond to requests for comment late on Thursday. 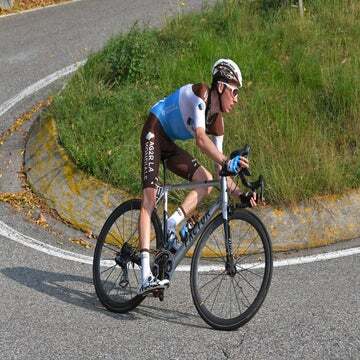 At finish in Peyragudes, Bardet was third overall and Uràn was just behind him in fourth. Bennett sat ninth in GC. Regardless of jury’s ruling, Uràn and Bennett both maintain their placings in the overall. Caley Fretz, Andrew Hood, and Fred Dreier contributed to this report from Peyragudes, France.